Some improvements are underway and recently completed at various Vintage Oaks amenities. Recently the Lazy River was drained, the surface was cleaned and minor repairs were completed. The Lazy River is now fresh, clean and ready to be enjoyed. If you visit any of our pools this summer, you will be greeted by the new pool monitors, who will encourage you to sign in. 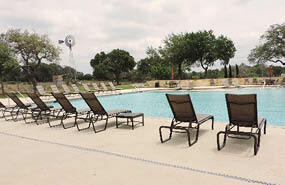 They will be monitoring the facility to keep the area neat and tidy and to remind property owners and their guests of the rules to ensure pool safety. The pool monitor will also have plastic cups for any owners or guests who might have brought a glass container to the pool area. To protect all Vintage Oaks property owners and their guests from injury, the pool monitors will require that beverages in a glass container be transferred to the plastic cups while on the pool decks or surrounding area. We have just received 3 new in-ground charcoal barbeque grills. These will be installed in the coming weeks in various locations around the facility, accompanied by picnic tables for additional seating. Please consider the outdoor conditions and take extra care when using these grills. A shade structure is currently being constructed over the playground so that the kids can enjoy the equipment all year long. The windows in the Wine Room and Fitness Room have been tinted. Please visit the area to see the difference this tinting has made. We feel certain you will like the much needed shading it provides and should decrease utility costs, especially this time of year. Finally, additional pool furnishings have been added to the pool decks and pavilion area so that more people can enjoy this area. You will see new padded lounge chairs and four top tables with umbrellas on the pool deck and cushioned seating, tables and chairs under the pavilion. To avoid any additional costs to the POA budget, SouthStar Communities partnered with the Property Owner’s Association in this purchase. The developer will also be adding to the trails system this summer. The new portion of the trail will leave from the clubhouse and travel northwest along the sports fields and enjoy some beautiful vistas. When completed, this trail will bring our walking trails total to 3.5 miles. We will be adding trail heads and markers this summer that encourage more of our residents to discover this beautiful trail system. As always, we appreciate your support and feedback as we continue to deliver a great experience for all of our property owners and their guests. If you didn’t have a chance to stop by the model homes at The Reserve for the Grand Opening you still can. Come and see the innovative designs of David Weekley Homes and Ryland Homes at the newest neighborhood in Vintage Oaks, The Reserve, located off Via Principale and Hwy 46. Homes range from 2,500 square feet to over 4,000 and start in the $400s. We recently released 21 new homesites in the Silver Oaks neighborhood. These 1+ acre homesites are located on two cul-de-sacs and feature amazing valley views, easy build sites and are heavily wooded.  Visit http://www.vintageoakstexas.com/new-release-valley-homesites to view the online interactive map. The whole family had fun March 22 at Family Night at the Vintage Oaks Clubhouse. The Texas Twisters kept the party going with classic rock and country hits under the pavilion. Some lucky little girls even got ‘on stage’ with the band! There were catered appetizers and a ‘roast your own marshmallow’ S’mores bar for the kids and adults. It was a great time to meet and re-connect with your neighbors. It was a race to find the hidden Easter eggs on Saturday, April 19 at the Vintage Oaks sales office. A blur of sixty or seventy children flew past and before you knew it, all 350 eggs had been found. After the kids opened their eggs to sample the treats inside, they moved on to the petting zoo. The children, some for their first time ever, were able to closely study the goat, sheep, ducks, young chickens and bunnies on hand. They also took part in pony rides led by their parents to round out the afternoon. On Saturday, May 3 the community came out to enjoy the beginning of the summer season at the Clubhouse and field area. The weather couldn’t have been better with sunny skies and temperatures hovering around 90 degrees. Kids had fun on the inflatables at the field and games and swimming at the clubhouse. There was an airbrush tattoo artist with designs from beloved comic book heroes to flowers and butterflies. Rick’s Hunger Buster food truck served up some delicious fare from their well-known Philly cheese steaks to Greek pitas and salads. More than 25% of the Vintage Oaks family consists of friends and family of current property owners. We are proud to have a community who wants their friends to live here too. If you have friends, family or co-workers that would love Vintage Oaks, tell us and we’ll give you $500 when they close on their new homesite. Vintage Oaks recently released a new section of their website exclusively for use by property owners. The web address is www.vintageoakstexas.com/owners. Here you can find important information regarding Social Gatherings, Architectural Control, Amenities Usage, information for the City of New Braunfels and a list of Board of Directors, Committees and their respective members. There is a direct link to the Resident Portal which is managed by RealManage, and a detailed list of what is available on the portal. Find a link to www.Nextdoor.com for access to the neighborhood social network plus email addresses for the various groups involved in the community.